A CiF Watch post on June 7 focused on a report by the Guardian about questions raised by some board members at the annual meeting of G4S – a British multinational security services company – regarding their business operations in Israel. The Guardian story by Jennifer Rankin featured the following photo from an anti-G4S protest, organized by Palestine Solidarity Campaign (PSC), outside the meeting. The hooded prisoner represented in this display of political street theater was meant to draw attention to what anti-Zionist groups allege is the mistreatment of Palestinian prisoners inside Israeli jails. Indeed, PSC, parroting the narrative of the Palestinian Authority, characterizes the prisoners in question as “political prisoners”, a term, as CAMERA has demonstrated, which is a euphemism for all Palestinians in Israeli custody, even those convicted of lethal terror attacks against Israeli civilians. Moreover, the sincerity of the “pro-Palestinian” sentiment of activist groups, and the Guardian editors who continually grant their cause a forum, seems quite questionable given their silence thus far in response to the disturbing sight of the following real hooded Palestinian – one of several photos released by the Hamas-run Interior Ministry in Gaza recently. The imagery above does not represent leftist theatrical agitprop, but a genuine photo of one of two Palestinians just before they were hanged to death on Saturday on charges of ‘collaborating’ with Israel – two of at least 16 Palestinians who have been executed in Gaza for spying since Hamas seized the territory in 2007. There is no mention of the execution on the site of PSC. Additionally, the Guardian’s correspondent in the region, Harriet Sherwood, though finding time recently to publish 3 stories about a Palestinian from Gaza who was a contestant on an Arab reality show, has thus far not covered the story. Moreover, this lapse in journalistic scrutiny of an extremely pressing issue relating to the human rights of Palestinians in Palestinian custody is not a one-off for Sherwood. She has also failed to cover the death of a Palestinian named Ayman Samara while in a Jericho jail, as well the broader disturbing story, reported elsewhere, involving the abuse and torture of Palestinian prisoners in PA run prisons. In reading the Guardian’s coverage of the region, it’s impossible not to conclude that their reporters’ activist journalism on behalf of the human rights of Palestinians is necessarily subservient to the broader ideological aim of vilifying Israelis. ” Were not bad and even if we are those guys are worse ” ??? That’s your line? I think peace will be a long time in coming. I think part of the problem is that Israel does not see its burgeoning prison population as dreadful because the US is worse. Since 67 nearly 40% of Palestinian males have been imprisoned. Can they all be thieving murdering criminals? You simply don’t get it, do you Roscoe? Or perhaps you just choose to ignore the point. The Guardian covers a demonstration alleging without direct evidence possible hooding of some Palestinians in Israel and does so in an unequivocably supportive way. The Guardian fails to cover the execution (and hooding) of real, named individuals in Gaza. By default, the paper takes no line on whether such treatment is justified, praiseworthy or shameful, or even a blatant breach of all the norms of modern society. This is not a one-off. As this site has demonstrated over the years, this is a recurrent pattern. The Guardian rushes to condemn Israel for every fault (whther real or imagined) at the same time as concealing the far more extreme actions of Hamas, IJ, the PA, Hezbollah, etc etc. Oh, yes, he does. But he can’t stop his sanctimonious babblings which give him great pleasure. And he can’t wait for the return of his hero, “nick-a-Nazie”. Meanwhile, rascal-boredom will consult his “famous in-laws”. The Guardian rushes to condemn Israel for every fault (whther real or imagined) at the same time as concealing the far more extreme actions of Hamas, IJ, the PA, Hezbollah, etc etc. Yup. Well, they’re not revealing the latter, at least. Propaganda straight from the PLO to Mondoweis to their dupes worldwide. Thank you for pointing out that Palestinians commit many more crimes, such as theft, and do not confine themselves to murder. Nah, they are committed pacifists that just love Jews. and preach non-violence. Get lost, sanctimonious douche-bag. In answer to your question, the Palestinian prisoners under discussion are not in jail for thievery, but they are in prison because they ARE MURDERING CRIMINALS!!! They are TERRORISTS! Murdering or attempting to murder innocent civilians is what terrorists do! Not only are these Palestinians remorseless killers, they are HONORED by their fellow Arabs as “heroes” and “martyrs” FOR THESE SPECIFIC, INDIVIDUAL ACTS OF KILLING ISRAELI CIVILIANS! By your reasoning, the Nazi SS couldn’t ALL be murderers, either, just because there are so many of them! Most of these Palestinian killers didn’t even pretend not to have committed their heinous acts; they were — and are still! — very proud of themselves. And before you throw in the incredibly idiotic reasoning that if the Palestinians do dreadful things, then the Israelis must be doing it too — don’t bother. The fact is that the Israelis NEVER target civilians as government-sanctioned acts and the few Israelis who do target civilians, are treated like criminals, not heroes. And of course, Rascal Boor knows all that very well. An accomplished douche-bag. Thank you for your polite reply Adam. Two things firstly I struggle to read an article by someone who calls himself Elder of Zion I realise it is tongue in cheek but I do not appreciate the joke. It reminds me of pro Israelis I have met who sarcastically call Israelis “evil” thereby instantly coloring the discussion in extremist terms. Rosco. Most generous of you. You state that it is “strentching credibility” to suggest that the figures are out by a hundred times? Well, let’s do the maths. June 1967 – January 2010 (the period in question) is a total of 510 months. If 800,000 Palestinians wre arrested in that period, that means that 1,586.6 Palestinians were arrested each and every month in those 42 1/2 years. Is that credible? Well, in 2010, Israel had a population of around 8 million (plus around 3.5m in the “occupued territories”. The population of England and Wales in 2010 was around 56 million. In England and Wales between 2002 and 2012, an average of 1,382.7 people (of all ethnicities and nationalities) were arrested EACH YEAR – that’s just over 115 per month. Now I know you think Israel is arrest-happy, but is it READLLY credible to suggest that Israel arrested more Palestinians per month than the TOTAL number of people arrested in a country 9 times the size (allowing for 4 million Palestinians, which is generous) in each YEAR?? No – I would suggest that these figures are vastly inflated. By the way – my figures are not from “wiki” but from official police statistics. Proper research tends to lend credibility, you see. Sorry – of course, 56m divided by 4m is not 9. It is 14, which only goes to strengthen the point. (In other words, the pool of potential arrestees under consideration is 14 times larger in England and Wales as the entire population of Palestinians). Don`t wait for a serious answer, the jew hating troll will immediately deflect. In England and Wales between 2002 and 2012, an average of 1,382.7 people (of all ethnicities and nationalities) were arrested EACH YEAR – that’s just over 115 per month. That can’t be right. It must be 100 a night in Blackpool alone. Carefully reading is none of your business, imbecille. Elder of Ziyon, that is. The self-styled “Israel lover” was quick to spread a mindless LIE and he’s being “generous” to recognize when caught. What an amazing hypocrite. Yeah, spreading lies because he is used to Al Guardian`s policy of nurturing lies about Israel. “Yeah, spreading lies because he is used to Al Guardian`s policy of nurturing lies about Israel.” – where BTL commenters call Israelis evil. Poor sensitive soul. Well, we already had a lot of idiots here thinking to come up with their usual lies without being punished. We teached them a bit. No.I am a great English lover ! I doubt that he is a great lover. Rosco has come here to teach about self-love – the sanctimonious kind. For there to have been 800,000 Palestinians seized by Israel in 46 years the monthly total would be some 1,500, not the 10,000 claimed by EoZ. Until Israel operates its occupation in a judicial fashion, stops interfering with UN staff and allows visitors to get to Palestine there is no way to know what the numbers are. We should salute those who try to document the horror of what is going on. I’m a little bit puzzled that some Israelis seek to deny that Israel is the only country in the world that legally tortures prisoners. After all, other places do it illegally – so why is legal torture worse than what happens in Saudi? Oh, look who´s back, nick-a-Nazi, the hysterical Jew-hater. Hey, Roscoe, come quickly to defend this poor disinterested truth-finder! ” Nick a Nazi.”.where do you get such gems? ?..a true wordsmith. Jewish writers have been the single most important of all writers in my life and you are clearly going to be another. If you had a tiny bit of honesty instead of bloating your smug “wisdom” you’d have figured out that this “nick” is a Jew-hating fraudster, that was banned from at least two other sites for his relentless spreading of recycled lies. But, no, you opted to defend him and you still do. No wonder nobody takes you seriously. He shys away from directly defending NSNick, that moron. When I see evidence of this I will attack him. I am unwilling to just take your word given that your total effort that I have seen so far has been to call me names and behave like a naughty 13 year old. When that imbecille will recognise the meaning of evidence, he will already be dead, by natural circumstances. Ever since I came here Ser Jew has attacked me calling me an anti semite and a dozen other names. To be honest I did not understand Nicks post . He could be wrong I don’t know. All I know is that Ser Jew called me an anti semite as well so Nick almost certainly isn’t. Let me refresh your memory, rascal: the very first post of yours in this blog was a whine about whether it was “right for you”. Then, you immediately took the side of the glaring Jew-hater “nick”, as you still do. Now you are in your delicate-flower mood; the poor victim of sarcasm and jokes. Well, grow up. Or STFU. And yes, you are a sore loser. NSNick tortured by his shallow mind is back. Thanks Nick for your evidence-free rant complete with straw men (“some Israelis seek to deny that Israel is the only country in the world that legally tortures prisoners” – I think there are 3 straw men in that phrase alone), total inversions of reality (the suggestion that Israel, the country which, to its own detriment, is perhaps unique in allowing a completely free press and the freedom, even to members of its parliament, to speak out against its own existence) somehow suppresses the truth; and vague unsupported allegations of “horror”. Come back when you have something construictive to offer. Yes, Labenal, Israel is “the only country in the world that…” take your pick, but it must be something nasty to isolate it from the rest of the “wonderful world” full of “legal” norms that Nick pretends he and “everyone else” lives in. The 10,000 number was based on the previous six months as of the date of my writing, given that Addameer went from 750,000 to 800,000 in about six months. from 2009-2010. Hang on a minute sunshine. How many of these 40% been imprisoned by Israel? How many by the Lebanese? How many by the Kuwait authorities? How many by the Syrians? How many by the Egyptians and Jordanians? And finally, how many by their own governments? I think you’d find that more Palestinians been killed and abused in one way or another by their fellow Arabs “brothers” then by the Israelis. A ₪100 note says that that figure is a massive whopper. I can understand if those defending Israel said Israel does not do everything it is accused of but to defend Israel by saying so and so down the road is even worse than Israel and than argue Israel is the best thing since sliced bread is just not credible. Israel regularly imprisons individuals with due process. It currently holds a person it kidnapped from Ukraine and is holding him without trial. In 2012, it executed a member of the HAMAS team Israel was negotiating with at the time and went on to kill several hundred more Palestinians. Israel has been implicated in many extra judicial killings. Perhaps it is about time Israel is hold to account for its crimes. Israel’s crimes cannot be whitewashed just because these crimes are primarily against the Palestinians. Jim, Israel is at war for over 60 years. Name one other country who is at war for that length. And no, Palestine is not a valid answer. Iraq would be a valid answer but Iraq under various governments has killed more people than Israel has not mentioning torturing them in ways Shabac people can’t even dream of. Israel was not negotiating with the drug lord Jaabari. Let’s face it, you wouldn’t know the real reason behind Jaabari’s assassination. Every single country in the world would behave in the same fashion or worse in times of war. Given half a chance to eliminate a threat that cannot be reached in any other way, and any Western” country will take that threat down after weighing the pros and cons. And for the record, I do not think Israel is the best thing since sliced bread. Just like to clarify that my opinion of Israel as a state and as a people is broad. Like with many western societies there are some aspects that are amazing and some that are disappointing. With regards to the people of Israel there are wonderful people and terrible ones. And that goes across the spectrum. From Sepharadi Jews to Ashkenazi Jews to Muslims of various sects Druze, Christians and secular people. I have to say though, that with all the flaws Israel is a melting pot and as such has a wonderful array that shines in many aspects where European countries fail to. I don’t know why but even at these hard times where we find Southern neighbourhoods in TA experience hard times and where asylum seekers from Africa that are law abiding citizens experience fear yet again at the fault of local councils that did not find a solution for them in time, we still see that array of opinions and talks of how to resolve matters. I’d like to point out the following to people who push forward the Apartheid argument. As you can see the numbers of young Arab women who volunteers to “National service” exceeds that of men. They find this a way to liberate themselves from the control the tradition forces them into. And why wouldn’t they want to take control of their lives. But unlike in Libya where the women who assisted the revolution for the same reasons were later abused and beaten the young Arab women are being supported to a better future where they can push their status higher. So Israel is not perfect and there is much work to be done, like in every place on earth, but being a Jewish national home that respects the minorities and protects them has its benefits. Not credible your arse. The point is that things are MUCH worse than the I-P conflict, MUCH, MUCH worse. And what your type of Jew-hating hypocrites have to do to face this reality? Declare an absolute un-reachable standard of perfection that Israel must attain, so when she fails they are ready to whine and hector. Some news for you, jim-jones, YOU have zero credibility. YOU are nobody. Deal with it, pathetic sock-puppeteer. Oh, good Lord! As if it wasn’t bad enough to read the fairy tales written by Rosco, who is nothing more than a smug, sanctimonious, very ignorant twit, now we have to put up with Nick who, in addition to being incredibly misinformed, is openly anti-Israel to the extent that his rants are illogical and a total farce. I mean, really, to state that Israel has “legal torture” when it doesn’t even have the death penalty, is simply ludicrous. Please note that I am not addressing this comment to Nick or Rosco because they both lack the integrity to learn about something before they opened their mouths. 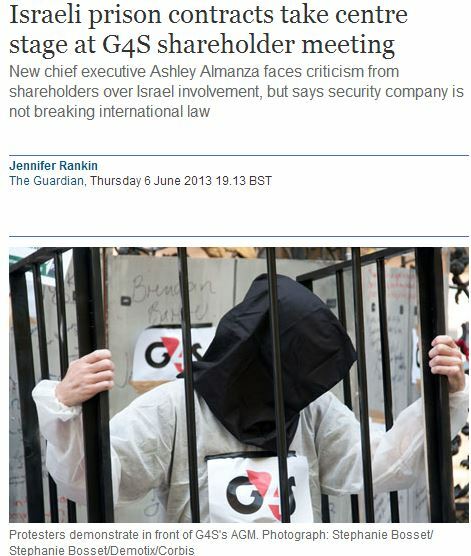 And what about the headline “Israeli prison contracts take centre stage at G4S shareholder meeting?” Did the contracts really ‘take centre stage’? Or was there just that bogus protest outside? Fritz, I’m sure Rosco will come up with some excuse why it would be a “struggle” for him to read that article. He is such a looser. “He is such a looser”? I have just finished a post saying that Jewish folk are probably the most literate in the world . I meant most Jewish folk! Let me understand this, Rascal Bunny: you start in this blog by whining; immediately and repeatedly sides with the disgusting Jew-hater “nick-a-Nazi”; barf lies and idiotic tales about daddy, “famous in-laws” and such BS…and we still have to be thank you because your highness appreciates Jewish talents? Just insane. No wonder the UK is going down the drain so fast. Ask Adebolajo about it. I read it and condemn it as the filthy piece of Jew Hatred that it is. Why would it be a struggle for me to read ? Your picture of a critic of some Israeli policies is cartoon like. Israel could be a sensational country . As a child my parents spoke of it with awe and wonder. Jewish folk are amongst the most literate and hard working people in the world. So are you saying you are a “Jew Hater”, only an abnormal one? I hope I misunderstood you. Sorry ItsikDeWembley I was being sarcastic … stupid really as I hate it in others. Ser Jew keeps on using the term . I should have used quotation marks.I beg your pardon. As for your other point re Zionism.Is it racist ? I actually don’t think it is important I believe in a safe Israel . What has happened has meant that Jews will never be happy unless they live in a Jewish dominated state. Within the 67 lines of course. I will not even debate that point. Dodging, as usual. Sore loser. Your arrogance is beyond belief. You make a statement and then have the nerve to say that you will not debate Israel going back to ’67 lines? So, don’t debate, just shut up and listen! Israel has the right to safe and secure borders! The ’67 lines that you are referring to are really the ’48 lines and those lines were never an official border and, more importantly, THEY ARE NOT SAFE AND SECURE!!! Judea, Samaria, and the eastern part of Jerusalem were included in the very small part of the Palestine Mandate that was to become Israel. However, Jordan conquered those areas in 1948 and renamed them the “West Bank” (Go back and check out maps of that area, by all means.) During the following 19 years until 1967 when Jordan controlled that land (and had forcibly evicted the entire Jewish population), there was not even a hint of talk about a homeland for the Palestinians. In fact, prior to 1967 when Yasser Arafat — an Egyptian — formed the PLO, you won’t find any mention at all of “Palestinians” as a separate political group. (Check any newspaper you want, including Arab ones, and see for yourself.) During those 19 years, Jews were not able visit their holiest places and the Jordanians — not “Palestinians” — desecrated many Jewish places. The Arabs even used centuries old headstones to line their toilets! When Israel won that land back in 1967, the Israelis opened up Jerusalem to everybody and that still remains true today. 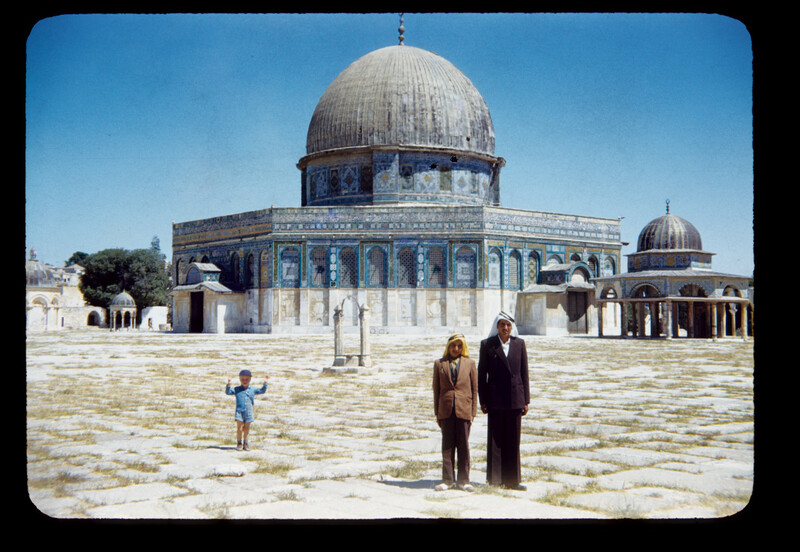 Incidentally, the Dome of the Rock only got its gold dome after 1967 as well. Before that time, it had fallen into total disrepair. (I’ll bet that you don’t know that Jerusalem is not mentioned even once in the Koran and Mohammed never went there.) Thousands of Israelis died in order to keep Israel safe (my fiancé was one of them; he was killed in the Yom Kippur War in 1973) and you think you have the right to tell Israel to give that land to people who have sworn to eradicate her? Well, you don’t!!! Thank you for adding the photo. Do you happen to know what year that photo was taken? Apparently it was taken in the 1950s. The Elder of Ziyon already covered this in 2012. Dodging, as usual. Sore loser indeed. On another note Mr. Burns (and since this is off topic anyway) could you kindly tell us if you believe Zionism is racism or not? I believe I know what nick would say, hence why I do not bother him with this, but I’m interested to know what you make of it all? It already is a pretty sensational country, sanctimonious twit. Oh, yeah, you manage to be an accomplished douche-bag. Congrats. you deserve it. Obviously,hanging hooded prisoners is not news for the Guardian. If Israel did it,it would be headlines,definitely,guaranteed. All you need to know about the Guardian’s credibility as a newspaper,as opposed to a propaganda rag. The new troll’s not very good is he/she/it? I have found photos elsewhere today of a sort of mobile gallows in Palestine (see flags etc) and a guy is hanging in red.This may be a clue and prove that the news is in fact out.